I’d love to say that the rest of our journey across North Dakota was as phenomenal as our visit to Theodore Roosevelt National Park but it wasn’t quite as spectacular. 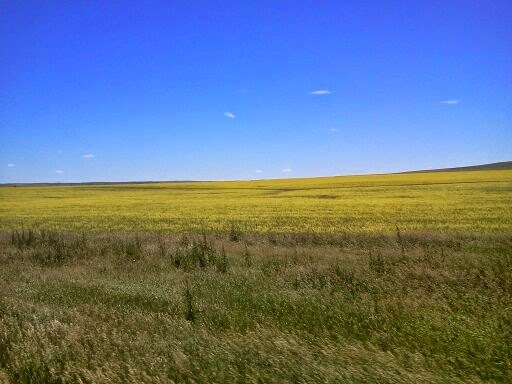 There’s a lot of wide open space in North Dakota. Vast…empty…space. Well, maybe not empty. See, there’s grass and lots of yellow flowers…. Some how I convinced Clark that a MUST SEE in the state was driving the Enchanted Highway. After all, I had read about it in my 2001 publication of Eccentric America guide book and we had agreed, prior to hitting road, that we wanted to incorporate some of the weird and quirky sites in America (ala the Griswold Family Vacation). What better way to do so than to travel 32 miles due south when we needed to be traveling east to get to our next destination, especially when your rig gets about 6 mpg? Well, let me tell ya…the sculptures, which make the Enchanted Highway…ummm, enchanted, are freakin’ cool. Although I’m pretty sure that Clark would have rethought this little detour had he realized (read: had I told him) that we would have to drive 32 miles due north to get back on the main highway after seeing these sculptures. The pictures won’t do them justice (since part of the bargain we made was that we’d drive the highway but not stop). They were created by sculpture Gary Greff to attract tourists to small towns like Regent, where Greff also built a hotel (The Enchanted Castle) which carries on the theme. Made of scrape metal, Greff worked out a deal with local farmers for the use of their land which includes turnouts at all 7 completed sculptures (#8 is in the works). Grasshoppers in the Field (1999) This guy is 40 feet tall! Come on…that’s pretty awesome, right? 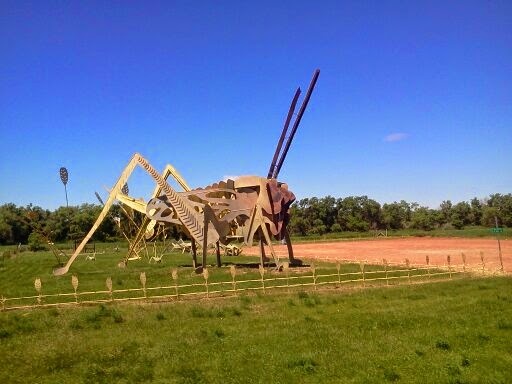 Humongous sculptures, some history and ingenuity all rolled into one. 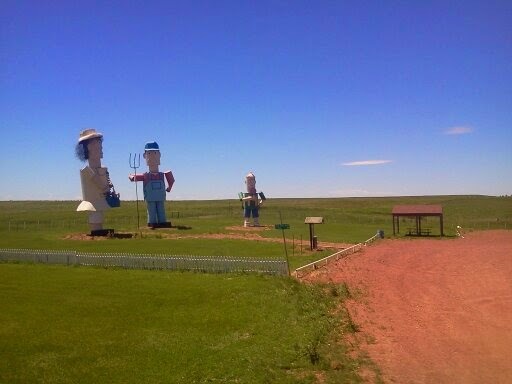 But hold on…that’s not all we saw on our drive across North Dakota! There was also, Salem Sue, the World’s Largest Dairy Cow!! Can you see her on that hill? Ah there she is…standing 40 feet high!! And, there was also the World’s Tallest Buffalo!! This bad boy weighs in at 60 tons (it’s made entirely of concrete). The World’s Largest Buffalo is housed at Frontier Village and National Buffalo Museum off of Highway 94 in Jamestown. It’s a nice place to stop with a little frontier village and picnic spots as well as a souvenir shop and the actual Buffalo Museum. The museum is home to the North Dakota Buffalo Foundation which maintains a herd of 30 bison…one of which is a highly sacred white buffalo named White Cloud. The herd with White Cloud resting on the right. A little shop down the road sells souvenirs and has a couple of young buffalo in the back that you can feed. It’s pretty sad and appears to be a separate, privately run establishment. Oh, and there’s plenty for the kids to enjoy at Frontier Land. As well as inappropriate photo-ops. For you readers of Western Novels…good ol’ Louis L’Amour grew up in Jamestown, North Dakota. Inside Frontier Land you’ll find a complete collection of his novels (which he called frontier stories) housed in the Louis L’Amour Writer’s Shack. In our youth, Clark and I both read a ton of L’Amours books. So, it was a nice surprise to stumble across L’Amours hometown and to see the land that inspired so many wonderful stories. We had no idea that this stop would become part of our Read Tripping. I think there are probably a lot of his fans now traveling the country via RV…the modern world’s version of the covered wagon. 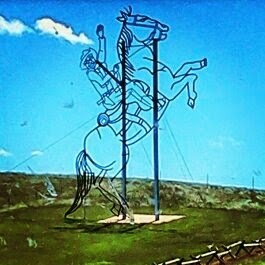 *Note: We made 2 overnight stops (one night each) on our way through North Dakota. One was at General Silbey Park in Bismark and the other at Red River Fairgrounds in **Fargo. I have no pictures of either and the only thing I remember about the fairgrounds was that it was crowded and confusing. It seemed to be filled with “semi-permanent” residents and was not-so-quiet. Also, the morning we left Fargo (a Saturday) there was a Color Run at the fairgrounds so we had quite a time trying to leave due to pedestrian traffic. Tip: when staying at a fairground look at their schedule for event overlaps. **Side Note: For fans of the movie Fargo (and who isn’t?!?! )…not one single scene was filmed IN Fargo or even in North Dakota (according to IMDB). It was filmed in Minneapolis. So if, like me, you were hoping to go see the car dealership, or the cabin in the woods, or the restaurant used in the film…well you’ll be really, really disappointed. For me, there is no longer any reason to even visit Fargo, ND…ever again. Haha! I love the last pic of you at Frontier Land!! Never heard of the Enchanted Highway…love the photos! That's been added to the bucket list. Looking forward to more posts on your travels! That's my favorite too! I swear I was expecting that spring to break…which would have been HILARIOUS!! Thank you Jonell! If you go to North Dakota it's a nice diversion. And it's really a pretty trip (even if out of the way a bit). If you aren't in a hurry (unlike us at the time) it would be worth it to try to find a place to came along the way.